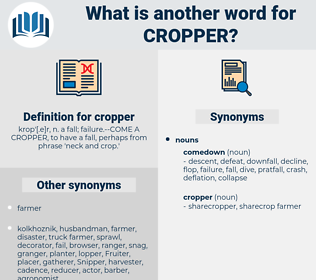 What is another word for cropper? building, attainment, good fortune, boost, achievement, creation, improvement, success, promotion, accomplishment, elevation, triumph, boon, ascent, win, increase, rise, fortune. development, betterment, growth, progress, upgrade, strength, strengthening. benefit, assistance, advantage, help, blessing, aid, opening, profit, solution, convenience. A neighbouring squire had had an accident; he had come a cropper in an awkward place - just at the finish - with consequences that looked grave. 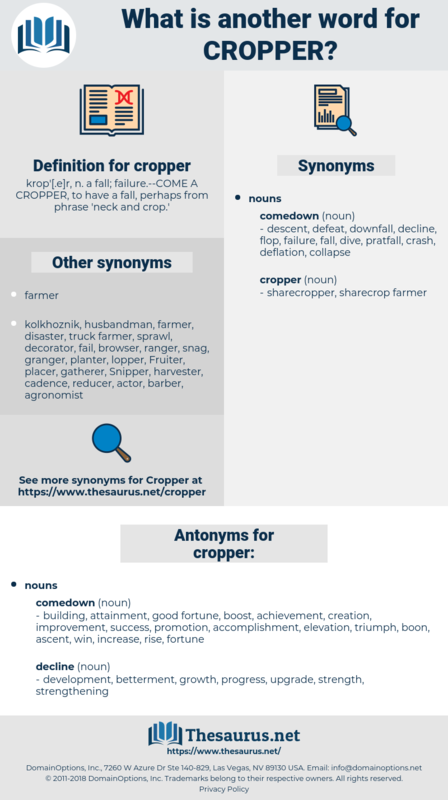 But then I came a fearful cropper, and on top of it I've been out in the rain all night. charivari, carver, cherry pepper, carrefour, crowberry, carry over, carfare, Coosa River, Chari River, car-ferry, crepe paper, carob bar, Curry Favour, crowbar, Carpophore, croupier, care for, carper, cry for, crupper, checkerberry, creeper, carefree, carry-over, curry favor, crapper.